My time with the drum carder is over. It went back at last months and the 4 weeks that I had it were a crash course in carding. I made the first batt because I wanted to see what would happen and it turned out pretty despite my complete lack of knowledge. With one batt under my belt, I decided to do a little research and figure out how to actually use a drum carder. What could you make with one? What could be carded? Maybe more importantly, how do you clean one? I watched videos, read articles, and came across people that knew what they were doing. People that threw in disorganized fiber and had art come out the other side. Up to this point, from the lone batt I’d spun and most of the listings I’ve seen on Etsy, I had the idea that batts were an everything and the kitchen sink kind of thing.The kind that was 3 types of wool, sparkly bits, silk noil, and some angora for good measure. After my research, I found out differently. Sure, there are kitchen sink batts but batts can also be smooth and uniform. They can focus on color instead of texture. Batts can be bold or subtle. Fibers can be carefully blended or smashed all together. Variation is awesome stuff. My batts got better was the weeks went on. They’re all on the subtle side since I just wanted to prep my stash of unprocessed fiber to spin - several ounces of alpaca, locks, angora, and random mystery wool. I wanted to play with color too but ran out of time. Well, I can always rent it again. The very first batt was 40g of mystery wool from a Gwen Erin grab bag. Second batt was made from 40 g of Corriedale roving. This batt is my attempt at duplicating a rolag given to me at a previous guild meeting. Looks similar but I won’t know for sure until I spin it. These 4 soft and lovely batts were carded from the very first ounces of my fiber stash, 4 oz of light rose grey alpaca. Took me years to prep this fiber and I’m glad I finally did. The Romney, and reason I rented the carder, turned into 2 batts. 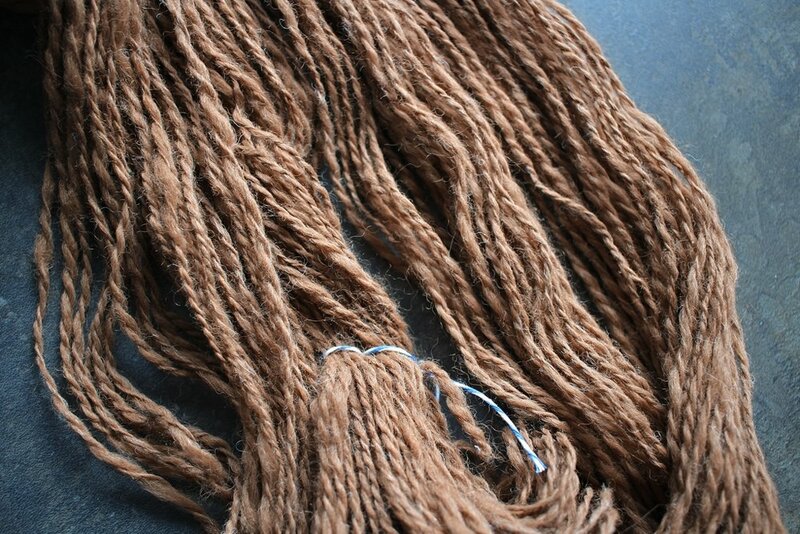 More alpaca from the stash which got a good wash before going on the carder. Had a small sample of a BFL and Silk roving that I decided to blend with half its weight in Angora. The batt is wonderfully soft with great luster. Last batt off the carder was 14g of 100% Angora. Working with straight Angora was more difficult than blending it with wool but not impossible. It’s nice to have my kitchen table back but I kind of miss having the drum carder around. I still want to play around with color and blending fibers. Plus, using the carder was just fun and I enjoyed it. Before I had one to my spinning wish list though, I’m going to spin up a few of the batts I made. If I like working with them and the finished yarn, I’ll do some research to pick out the perfect drum carder. Any suggestions on where I should start looking? This was what my kitchen table looked like pretty much all of Saturday and Sunday. See, this is the last week I’ve got the drum carder and I’m determined to make the most of it. I spent a good chunk of Saturday feeding 3 oz of light rose grey alpaca through the carder. It was amazing to see the fiber go from crimped locks to a soft and fluffy batt. Don’t think I’ll ever get tired of seeing that transformation. On Sunday, I carded the 2 oz of Romney bought at April’s spinning guild meeting. The very same Romney that prompted my last minute decision to rent the drum carder. Locks went in and a fluffy cloud came out. If it looks like a cloud, it has to be a cloud right? In total, I processed 5 oz over the weekend and I’m still not done. There’s more alpaca and angora coming from my distant stash. Until that arrives, I’ve got grand plans for this bump of fiber from Spun Right Round. Going to use it to try something new, The Monet Effect Technique from Grace Shalom Hopkins. Interested to see how carding recombines the pink, blue, and green together.